Our congratulations to Vita Yachts for the Vita, the very first recipient of the Gold standard Clearwater environmental rating for boats and superyachts. Vita Power was established in 2017 to bring the latest in automotive technology and engineering to the marine world. Its team comprises Chairman and Founder, Stewart Wilkinson, Managing Director and naval architect, David Gray, Head of Power and Performance, Peter McKinlay, and Head of Production, Adrian Gusman. They bring a wealth of experience from related fields including electric boats, the superyacht sector and F1. 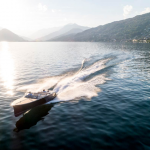 The Vita is a full-production electric boat inspired by classic boat building traditions.At 30ft long, it is powered by a groundbreaking propulsion system, incorporating proprietary throttle and touchscreen technology from Vita Power. 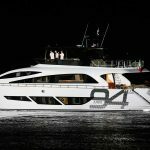 The boat was designed in the UK and will be built at Vita’s new hub on Lake Maggiore, Italy.The innovative power system integrates 130kWh of compact and lightweight liquid cooled Lithium battery storage with two 180hp electric water jet drives, controlled by an intuitive touchscreen interface. The Vita boasts a cruising speed of 25 knots and builds to a sprint speed of approximately 40 knots. Pictured here receiving the certificate from Clearwater Rating’s Maria Garcia-Donaire is Stewart Wilkinson.